If your client has a fear of technology then it's possible that they've build a mental block around themselves regarding learning more about the internet, computers, email, etc. however, in today's ever changing world it is useful to keep abreast of new advances. 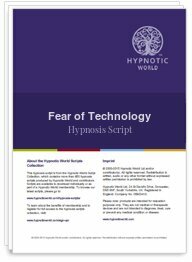 This Fear of Technology hypnosis script download can help your clients to overcome any doubts about their ability to learn and enjoy the new developments in technology and the impact they have on their lives.